A typically quiet end of year club meeting today, with three games played and a few drop-in visitors. Grant and John had a 28mm FOG-R game, both using Samurai armies. It all looked most spectacular! A couple of FOG-N games: Andrew (1815 Russians) beat Philip (1815 Netherlands), and Al and Mike had a game both using Peninsular British armies with the win going to Mike. Rather a low turnout at the club today, but we did have our AGM. The current committee was re-elected and fees for 2013 set at $50. At the meeting we discussed club competitions, plans for a multiplayer project (a refight of one day of Leipzig), and the topic of Rankings HQ was also raised. There were a couple of FOG-N games. Stu (Saxons) defeated Philip (Netherlands) 40-20, and Kendall (Russians) and Michael (British) had a draw. At the club today we had a couple of Flames of War games between Rob and Steve. Kendall's Russian Army of Poland defeated Al's Peninsular British. The British evicted the Russian grenadiers from a town and successfully brought on a flank march, but the Russian artillery was still too much for them. Brett's Austrian insurrectionists took on Danny's 1806 French. The much larger Austrian army was close to breaking the French, but couldn't get the last required unit before time was called. There was also a drawn game between Stu's early Saxons and Andrew's Italians. The slow moving Saxon infantry had made considerable progress towards the Italian baseline though. Michael's Peninsular British got a 30-10 victory against Philip's 1799 French Army of the Orient. The British lost both their cavalry regiments, but their remaining infantry won the firefight against the French. The charismatic General Kleber did good work rallying two routing French units, but not enough to save the whole army. WHFB - Alan and Rob had a Warhammer game, on a table featuring a great display of Alan's terrain pieces. Rob's African themed Ogres took on the Brettonians. Three games of Napoleonics today. Michael (British Peninsula) had a draw with Steve (Russian Guards). A creditable 14-11 result in Steve's first game. Brett (French 1815) got a comprehensive 22-3 win against Philip (Netherlands 1815). The Dutch-Belgians were holding off the French frontal assaults, but collapsed when the Old Guard arrived from a flank march. Kendall (1809 Russians) played Kit (1795 British in Flanders). Close to a disaster for the British who were only a point from breaking when we called time at the end of the day. 15-10 to the Russians. 12 November. Registrations for BattleCry 2013 are being accepted. 11 November. Added a link to the new NZWargamer forum. With the FOW tournament coming up soon, there were several more training games. Brett played Steve, Steve played Rob I, Greg played Rob II, and Michael played Kit. Also in WWII, Dan and Matt had a game of Bolt Action using 28mm Germans and Soviets. In Napoleonics, Stu's early Saxons got their first win in a really close game against Alan's Westphalians. Andrew played Benny in DBMM 25mm. Andrew also got the trophy for the army he had painted for Benny. There were four more Flames of War training games between Lee, Kit, Steve, and also Ken making a return visit from Wellington. Fog-N. Kendall's Saxons defeated Philip's Netherlands Corps. DBMM 25mm - Al (Later Hoplite Greek) beat Philip (Kushite Egyptians). A decisive victory to the Spartans with Athenian allies against the invading Egyptians. Kendall (1813 Prussians) defeated Brett (Austrians). 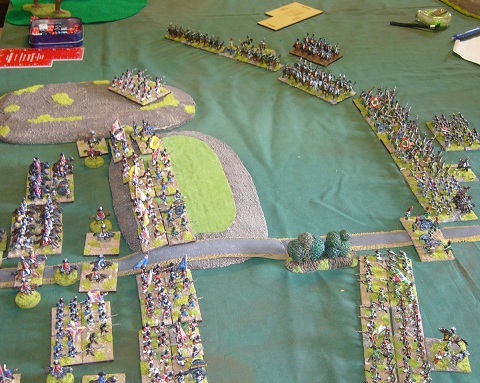 The Austrian army broke in the last move of the game before it was going to time out. Victory points were 20-5 to Kendall. The third Napoleonics game at the club today was between Andrew (French) and Michael (British Peninsular), using the new army lists. DBMM 25mm - Philip (Kushite Egyptians) beat Benny (Bretons with miscellaneous allies). The massed Egyptian archers deployed deep in anticipation of a Viking attack, which they survived. 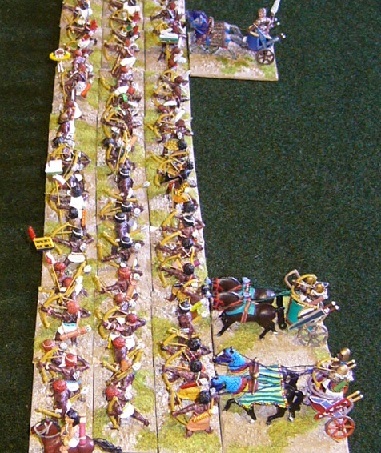 Meanwhile the Egyptian cavalry and chariots defeated the Breton heavy and light cavalry. FOG-N - a couple of Napoleonics games today. Pictured here are Kendall's Prussian guards attacking Alan's Westphalians. A glorious Prussian victory, accompanied by the singing of patriotic songs. In the other game, Andrew's French and Neapolitans employed a flank march in their attack on Brett's Austrian grenadier force. The main Neapolitan force fell back from the counter-attacking Austrians, who were themselves chased by the French young guard who arrived on the flank. After several hours neither army was broken, and neither was in good shape, but the Austrians were ahead on points. As well as hosting the second day of Push of Pike, it was also a regular club meeting day. 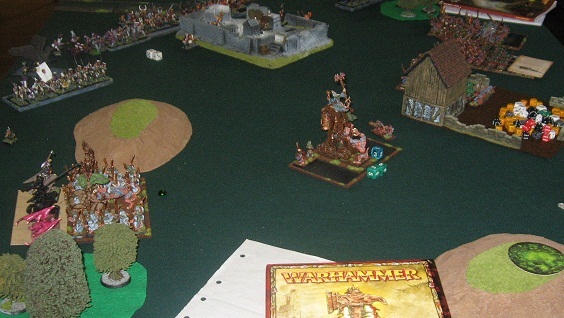 Dan and Matt had a Warhammer fantasy game, Orcs and Goblins versus rats. Greg and Andrew played Flames of War, with vast numbers of Soviet armour on the table. No Napoleonic games today, but much interest in the newly arrived book of army lists covering the Revolutionary wars and the Peninsula. The ninth annual renaissance tournament Push of Pike 2012 was held at the club this week. There was a good turnout with 12 players including several from out of town. First place went to Philip, Mark second, and Stephan third. There were two Maghrebi armies in the top three, and the best army award went to Philip's Maghrebi (Tripoli). DBA. Kendall and Nic had a game of DBA using 20mm plastics. Armies were Saxons and Vikings. DBR 15mm. John (Dutch Revolt) played Stephan and Rowan (Ottoman Turks) in a DBR training game. We should see plenty more DBR games next meeting as Push of Pike is on that weekend. FoG-N. Two Napoleonics games today. Firstly Andrew D (Russian and Allies) beat Al (British peninsular). In the other game Andrew's 1812 French broke Alan's Westphalians in a very close fight. FoW. Kendall played Greg in a late-war game. Another good turnout at the club today, which was good to see. FoG-Ancients. Alan's Normans took on Michael's Koreans in a game trying out the rule updates in version 2. FoW. Kit played Steve in a late war game. Lee had a couple of Flames of War games using his Finnish army. Firstly a win against Kendall, and then a 6-1 loss to Steve. 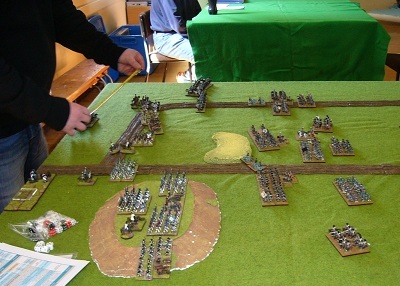 There were three games of FOG-Napoleonics, all ending with 40-20 wins. WFB: Alan (Brettonian) played Dan (Orcs and Goblins) with Matt as Dan's chauffeur. FoW: Mike (Hetzer company) beat Kendall (Irish Guards Infantry company) in a No Retreat mission. "Hetzers - Faaasands of 'em" said Vandeleur, who has a passing resemblance to Michael Caine. FoG-N: Kit (1815 British) beat Brett (1809 Austrian Army of the Danube) 22-3. Egged on by Messers Blue and Donald who pointed out mistakes in rule interpretation and tactics, Brett launched a confident assault into an unsupported, disordered British unit. Due to the Goldsbury Effect (the ability to roll nothing under 4 with multiple dice when it matters), the Austrians broke and streamed back through their supports and comrades, breaking another two units for an inglorious 40-20 to the Brits. Club report: Six tables set up with a wide variety of games. Good to see more club members getting in some games. Warhammer. Dan and Rob had another WHFB game, with lots of Empire and Rats battling it out. The game got a bit intense after 1st turn. Result was a fine victory to the Empire. DBMM 15mm. Philip (Mithridatic) beat Steve (Patrician Romans). Mithridates' own command was beaten, but the rest of the army fought on to get a 17-8 win. FOG-N. Andrew D (Russian guards) beat Al (Penisular British). The British found themselves attacking an army even smaller than their own, but got into some trouble when Russian cavalry occupied their LOC. FOG-N. Kit (1815 British) beat Kendall (Russian army of Moldavia). Flames of War. Brett (Finns) beat Greg (Germans) in a late war game. Flames of War. Ross's Soviet army of JS1s beat Michael's German Hetzers. It was a particularly cold day today, especially for those of us making an early start. But home advantage to the Russian armies. FOG-N. Andrew D (Russian guards) played Philip (1815 Netherlands). It was a see-saw battle, with lots of action ending with a mutual break. FOG-N. Andrew H (1809 Italians) got a decisive win against Al (British). Flames of War. Kit (Germans) played Steve (Soviets). Warhammer. Dan and Rob had a WHFB game, using the new Empire book.